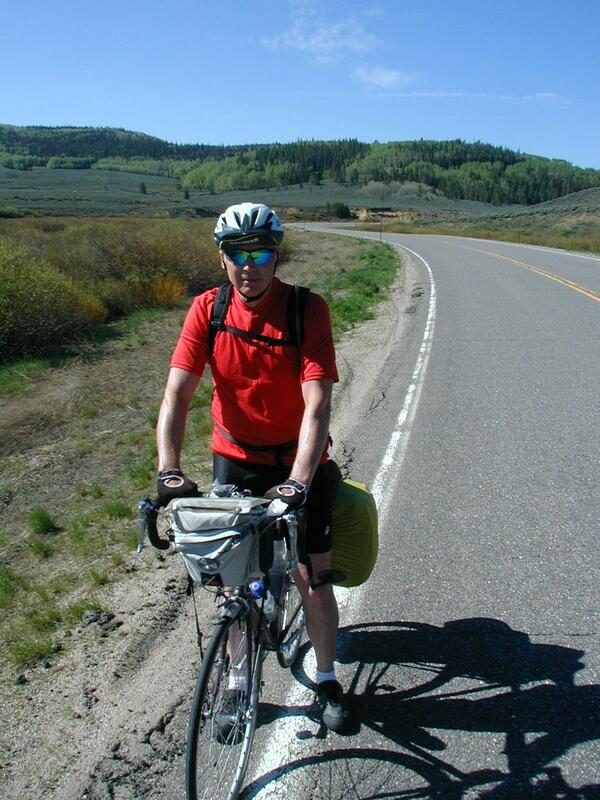 A week long bicycle ride from Salt Lake City to Fort Collins at the end of May 2003. The distance is 525 miles with a few larger passes but otherwise rolling terrain. I flew to Salt Lake City for a week of cycle touring. This ride is a continuation of sorts, with previous rides from San Jose to Reno (1999) and from Reno to Salt Lake (2002). It also connects my CO riding with other rides. I was looking forward to the ride and particularly some beautiful scenery and relaxing riding through the mountains. I was confident enough from previous trips to wait until night before, bring out the checklist and pack for my trip. Probably for the best since if I pack too long in advance, I have a tendency to keep adding to my belongings. A short an uneventful flight and I was in Salt Lake City. The bike looked fine, though the plastic bracket for front light was broken. I checked the GPS (40 47.145 N, 111 58.852 W) and then was off. Leaving the airport was high speed traffic and shoulders with rumble strips. Not the best to ride in the dark but I had flashers on and only three miles to my first night destination, Motel 6. Nice to be touring again. 3 miles today. 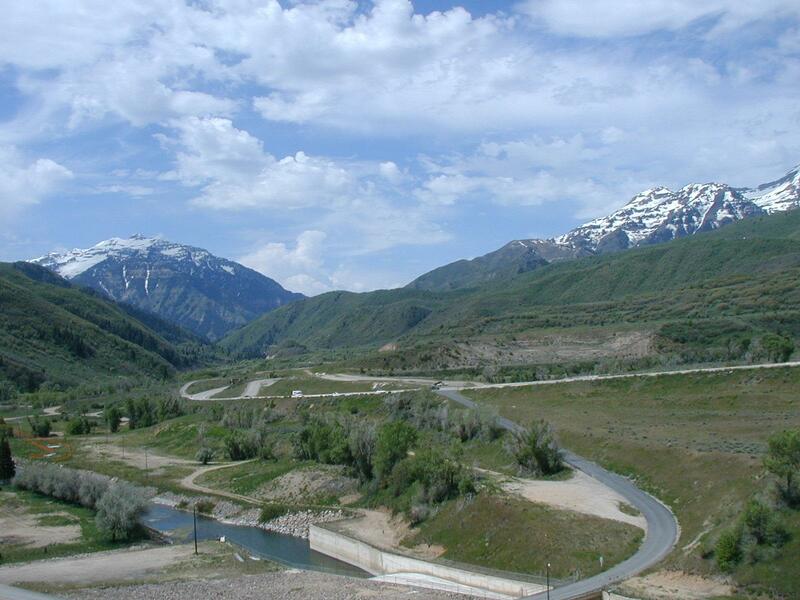 Today an easy ride as I mostly skirted around mountains that are to the east of Salt Lake City. 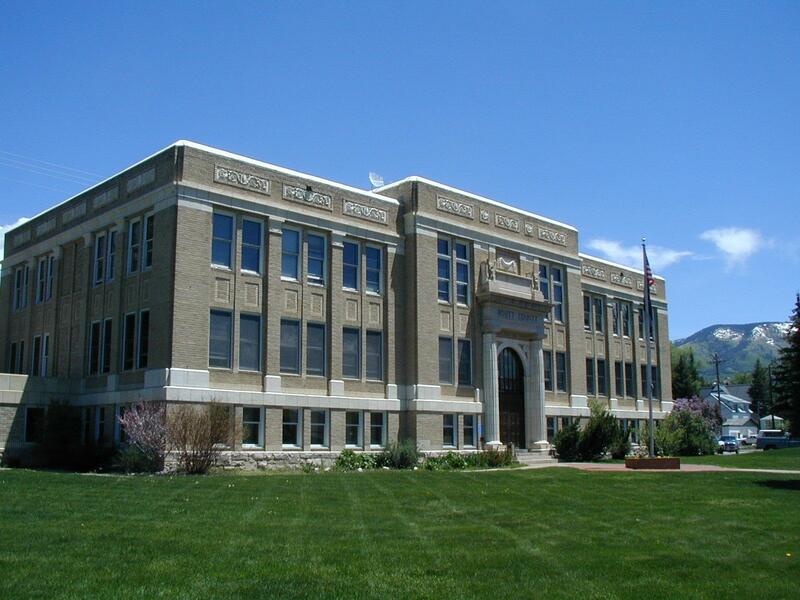 The route went south first to Orem and then up the Provo Canyon and in to Heber City. My bicycle has been riding quite smoothly. Only problem is I noticed this morning a dent in the frame that United Airlines must have introduced. I started on the road about 6am, with a short breakfast stop in first two miles. 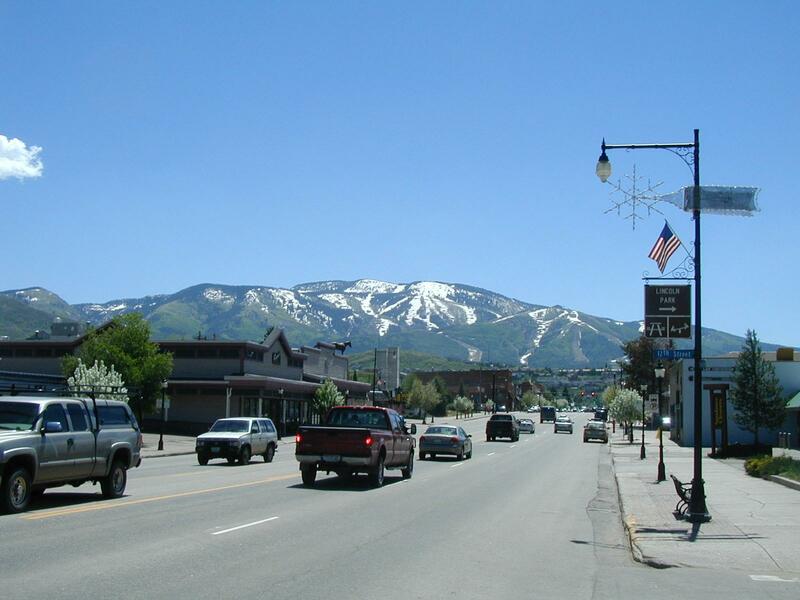 Salt Lake City is located in a broad valley. As I cycled highway 68 for the first 20 miles it felt like I wasn't making much progress as these towns all blend with each other, so felt like "I'm not really leaving SLC". I took a short break at 20 miles and suddenly views changed much more rapidly. A brief climb and at 24 miles I was on top of a hill and headed downwards via Levi, American Fork, Spanish Fork and to Orem. The road varied between one and two lanes with moderate amounts of traffic and with reasonable shoulders. At mile 42 I had a second stop at point where my route turned onto 52. A short stretch on 52 and I was at mouth of Provo Canyon. For the next 5.5 miles up the canyon I followed a separate bicycle/pedestrian path. It was quite nice cycling along the river, through the canyon and slowly climbing uphill. 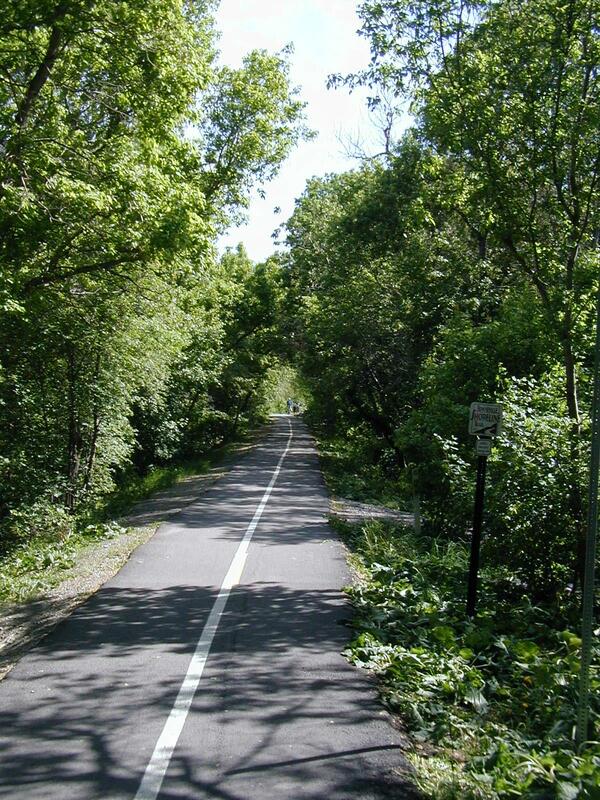 The trail was very popular with many other cyclists, joggers, folks with strollers, etc. A few picnic and camp sites were full with Memorial Day tourists. At mile 50 I reached Vivian Park and end of the trail. From here followed 189. The valley opened a little more and route became less steep. Busy traffic here and occasionally narrow shoulders. The road reached Deer Creek Dam and then the route wound itself around adjacent reservoir. All was riding well and slightly before 1pm I reached Heber City with 67 miles total. After a good lunch, a brief afternoon shower. I don't expect services or water for next 70 miles, so good place to stop for the day. GPS says coordinates are N 40 29.671, W 111 24.773. Nice to have a day I expected to be fairly easy turn out that way. 67 miles today. Today I went up and over the first of three large passes of the trip. Daniels Pass was 8000ft high and a climb from 5600ft at Heber City. Fortunately, I did the climb right at start of the day and rest of the day was more downhill than up. I started at 5:30am in the cool morning before the sun came up. The uphill started right away. At 3 miles I entered a canyon and followed the river uphill. It was a fairly even grade and slow steady climb. At 7.5 miles a stop at Whiskey Springs picnic area and bite to eat. Numerous trucks passed, many pulling boats. Presumably for Strawberry Lake. At 14 miles the grade suddenly became steeper as the road left the river and climbed last 2.5 miles to the summit. At the top was a lodge and store. Yeah! It took 2.5 hours, but was nice to get at the top. Beyond the summit a brief descent, but the road mostly kept around 7700ft as it skirted around Strawberry Lake. Many boats and also people fishing from the shore. Wide open views and meadows all around with few trees and some snowcapped hills. At mile 33 a brief climb before I left the lake and then an eight mile descent. Whee! A fun coast along a sandstone canyon as I was reclaiming some of the hard fought elevation from earlier. Stopped at Currant Creek store with friendly clerk at mile 41. 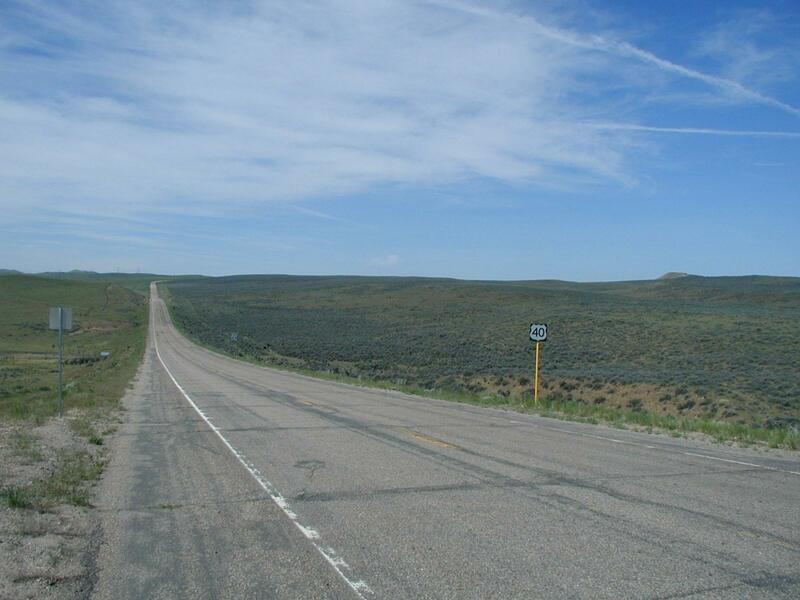 After Currant Creek, rumble strips reappeared. Unfortunately made most of the shoulder unusable, so I was riding closer in the lane. I passed Fruitland at mile 44 with its full parking lot at the Mormon Church and also small store. Not much else in Fruitland though. A few miles past Fruitland started a painfully slow climb. Not that it was particularly steep. More that it kept climbing for several miles and was also starting to get warm. Also I hadn't really expected it. Plod, plod, plod. Finally reached top and in area with some Pinon Pines. Rode along tops and then good descent down to Starvation Reservoir. A few miles past the reservoir was Duchesne. Duchesne was small town with one main street decorated with flags. One motel, a few cafes, a bank, a gas station and a few stores closed on Sunday. The cafe had good burger and also Sundae. I was a bit tired and bank thermometer said 85. 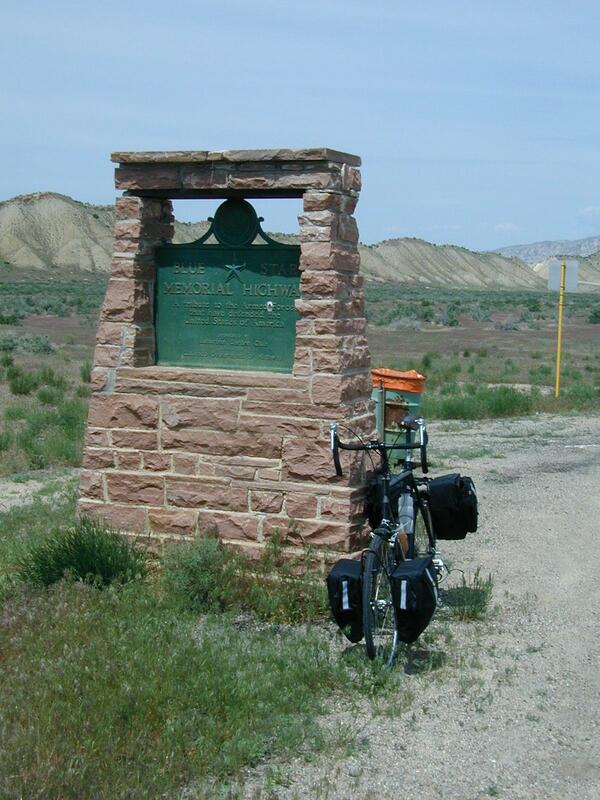 However, reports were of mostly flat terrain so I set off for Roosevelt. The motorcyclists were right, it was flat. Most of the route passed irrigated pastures. A few bluffs and in distance snow capped mountains. I rode slow at end of a long day. At mile 88 was Myton and brief stop at Ute Indian owned store. I asked and Roosevelt was "just over the hill". It was a reasonable sized hill and I even walked short stretch. However, with end goal in sight I pushed on to mile 97 and downtown Roosevelt at 4pm. Yeah! Motel clerks had stern look on their face when they told me to expect more hills from here to Vernal. GPS says N 40 17.880 W 109 59.273. Happy Memorial Day! Today a shorter ride that ended up just across the CO border at Dinosaur, Colorado. It has been getting warm in the afternoon, so nice to miss riding in the worst heat. I left Roosevelt at 5:30am in cool morning air. Some gentle ups and downs as I descended to the Uinta River and slowly climbed again, leaving behind irrigated pastures. After this there were multiple several mile long gentle grades both up and down in the first 30 miles to Vernal. Not many trees, so wide open spaces with sandstone buttes, small gulleys and desert looking terrain. After a slow six mile climb, I crested one last hill and descended down into Vernal at mile 30. 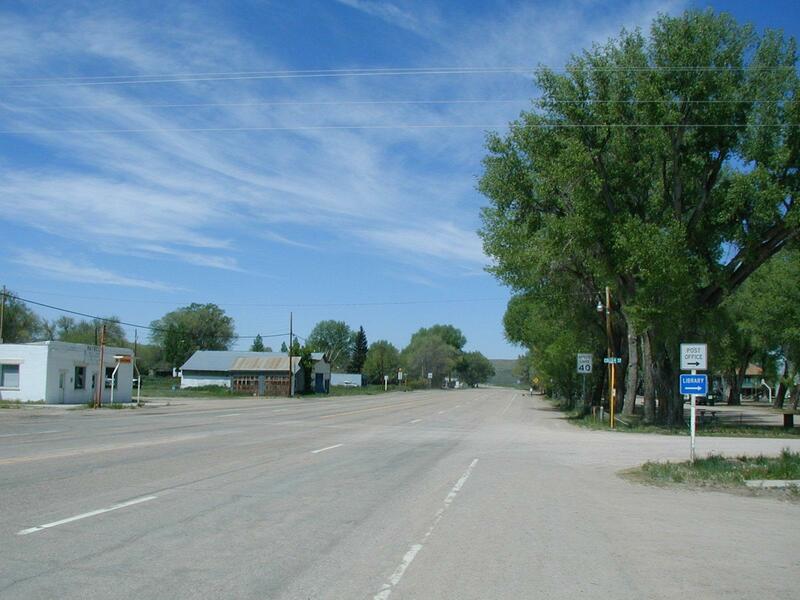 Vernal is clearly regional center for the area with a long main street, several miles of strip development and many different stores. 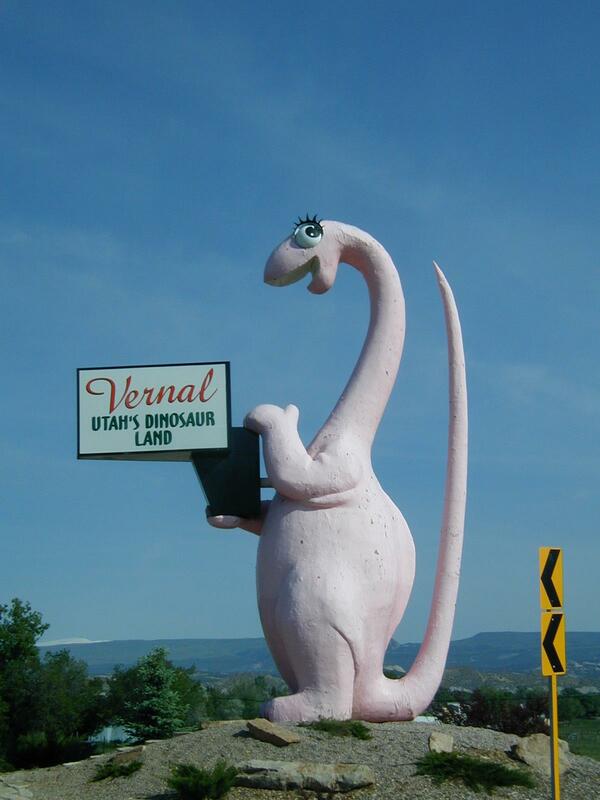 The town and many businesses and motels sported large model dinosaurs as their theme. Defintely trying to take advantage of the tourist interest in dinosaurs. It was still quiet on a Memorial Day morning. I had breakfast and continued on. The main road turned south past Naples and then descended to the Green River at Jensen. 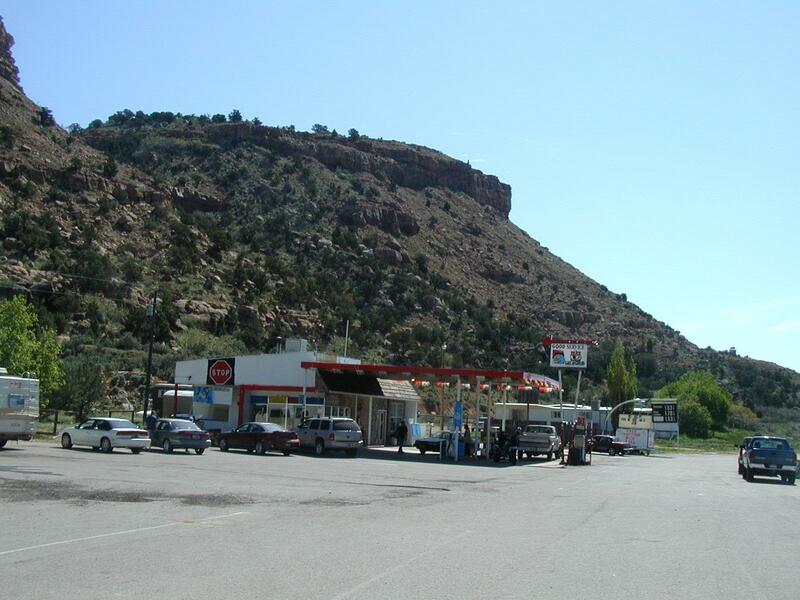 Jensen had turnoff to Dinosaur National Monument including the famous quarry. The proprieter of the store told me to expect some ups and downs in next 21 miles to Dinosaur. It was certainly more ups than downs as I climbed up and over the hills for a net gain of 1000ft. It was also warm and a bit slow. 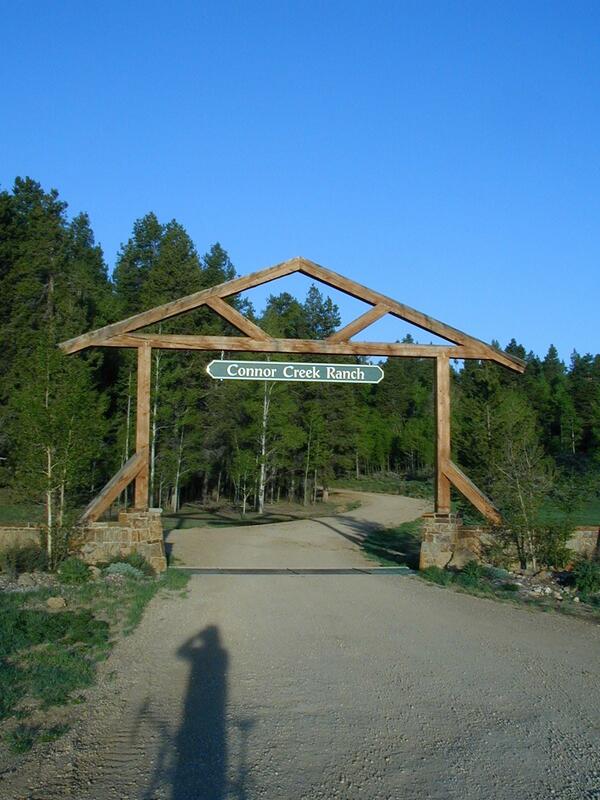 I crossed through a hogback and a mile later were signs for UT/CO border. Hooray! A short celebration before I climbed the last three miles to Dinosaur. It was only 12:30, but I decided to stop for the day to relax and get out of the heat. Reports from locals are to expect much steeper terrain with more hills ahead between Elk Springs and Maybell. Dinosaur is at elevation 5900ft and has population 319. There are three cafes but two are closed today. I ate at the third. 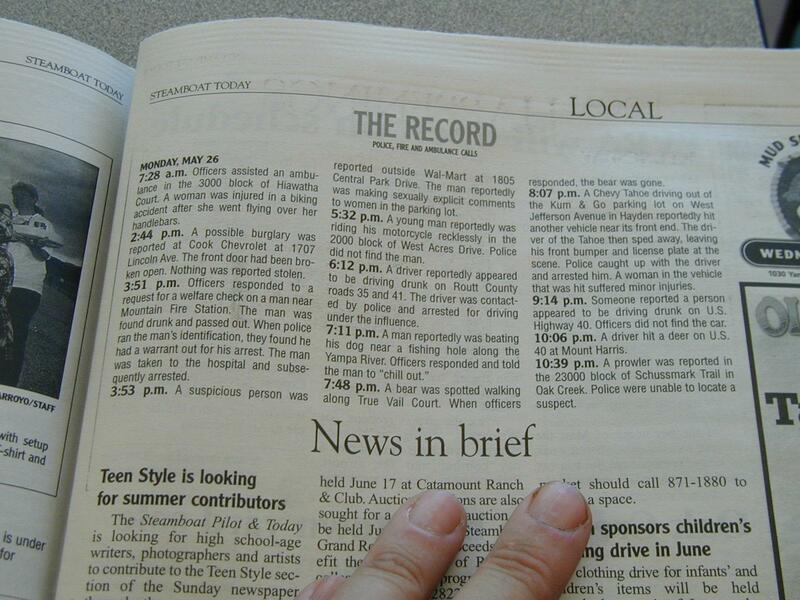 Among their specialties was a 2 pound hamburger. A guy had come in, ordered one and given up about half way through. You could tell he was going to be informal talk and gossip of the town. There is a Colorado Welcome Center here with helpful staff. A service station and a Loaf and Jug store completes rest of the town. GPS says N 40 14.717 and W 109 00.376. Seems strange since I expected W109 to be western border of Colorado and my GPS says I'm (slightly) west of there. 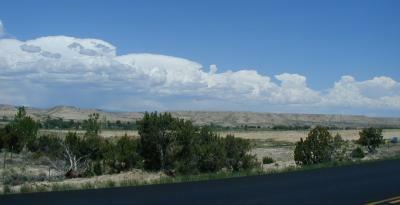 In the afternoon I bicycled to the Dinosaur National Monument Visitor Center located two miles east of Dinosaur. The center was small but had an informative film about the park, relief maps and literature. 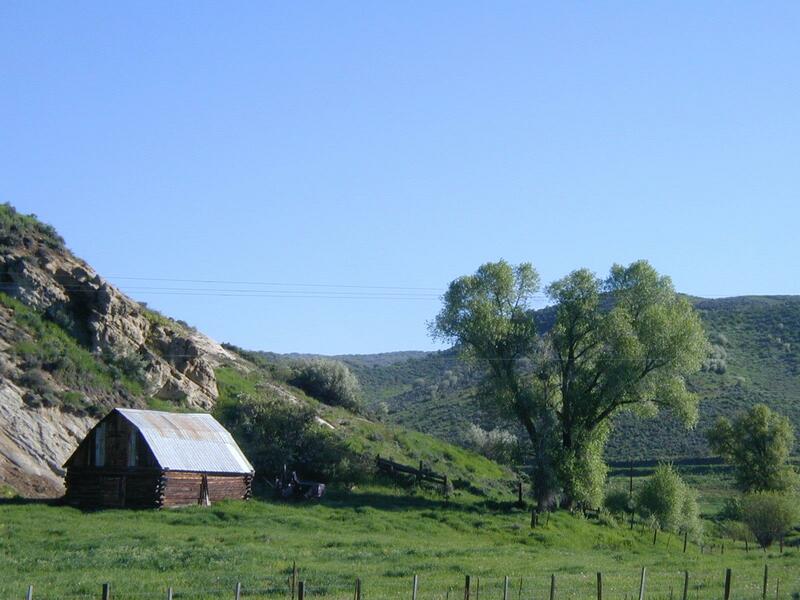 The park was established in 1909 around the Douglass Quarry and then expanded in 1938 to include large parts of Green and Yampa rivers. Rafting, hiking, fishing are among the popular activities in the park. A beautiful ride today through wide open spaces. This region has either no trees or short pinon pines. Lack of trees, clear skies and broad rolling vistas makes it seem like you can see forever. All day riding, but I'm still in the same county. Montana may claim a "Big Sky Country" label, but there is also a piece here in North West Colorado. After several warnings about hills ahead, I took off early again to beat the worst heat. I also carried extra water since there wouldn't be place to refill until Maybell at mile 57. It was gentle rolling terrain as I started out. Mostly grasslands. Long gentle grades both up and down as I passed along several drainages. At eight miles was Blue Mountain. I counted two houses. At twenty miles was the Massadona Bar and campground. All was still asleep but otherwise could have been place to stay. The road had a good shoulder with an eight inch wide rumble strip. Unfortunately a fair amount of debris including shredded truck tires. At mile 28 the first longer and steeper hills started. As I was cresting a small summit, my rear tire started to go flat. I found a piece of glass working its way in, but the cause of this puncture was actually a wire from one of those shredded tires. I carefully patched things and continued on. The road continued to climb past mile 34 and Elk Springs. In this next area and nowhere else were suddenly hundreds of fat crickets walking across the road. I tried to miss the ones I could, but too many to miss them all. The road climbed up to ridge at 36 miles and then had several longer ups and downs that gradually damped themselves out over the next 20 miles. I passed a turnoff for "I Do Fire" with no trees in sight and made final descent into Maybell. Maybell was another very small town with a large pretty park. 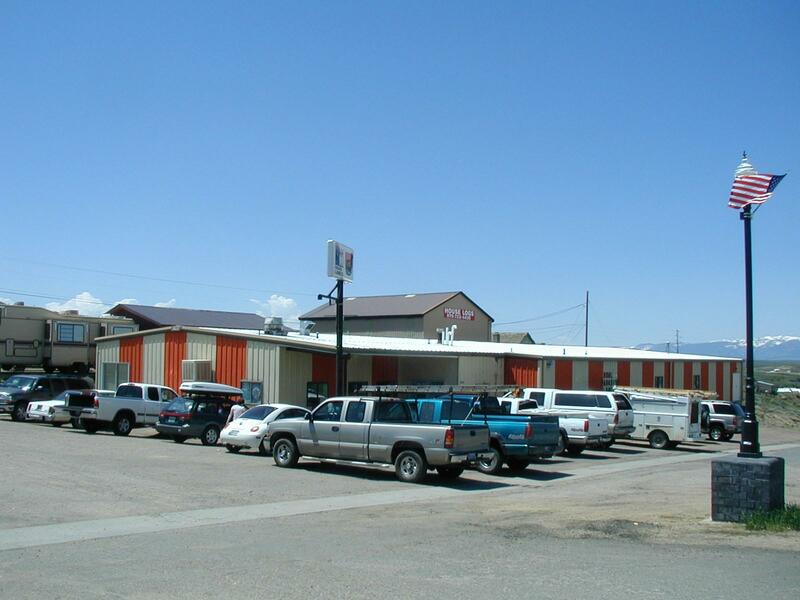 Two motels, one restaurant, a post office, a library and a gas station plus store. Looked like a quaint and quiet place. I ate at the restaurant and then decided to ride last 30 miles to Craig. The road started mostly flat as I followed the Yampa upstream and then a tributary. I saw several deer here. A few rolling hills in last 10 miles, but nothing I hadn't seen before. A large power plant outside town. A nice descent and into the metropolis of Craig just before 3pm. Wow, a real town with choices of places to stay or eat. GPS says N 40 30.881 W 107 33.309. 88 miles today. A shorter ride today and then restful day around Steamboat Springs. The road followed the Yampa River upstream and was mostly flat with only 400ft net elevation gain. I was out early in cool morning air. An occasional light headwind, but otherwise quick riding. Mostly pastures and farms. The road varied from 3ft shoulder to none at all. I stopped briefly at Hayden at 17 miles and fairly quickly to Steamboat. I crossed city limits at mile 40 just before 9am. The city sprawled along the river. I continued until just past the old downtown area and found place to stay. Nice walk along the 10 blocks of downtown. I found the library, a good bicycle shop (Sore Saddle Cyclery), a bunch of old quaint shops along the main street. I also found the original "Steamboat Springs". 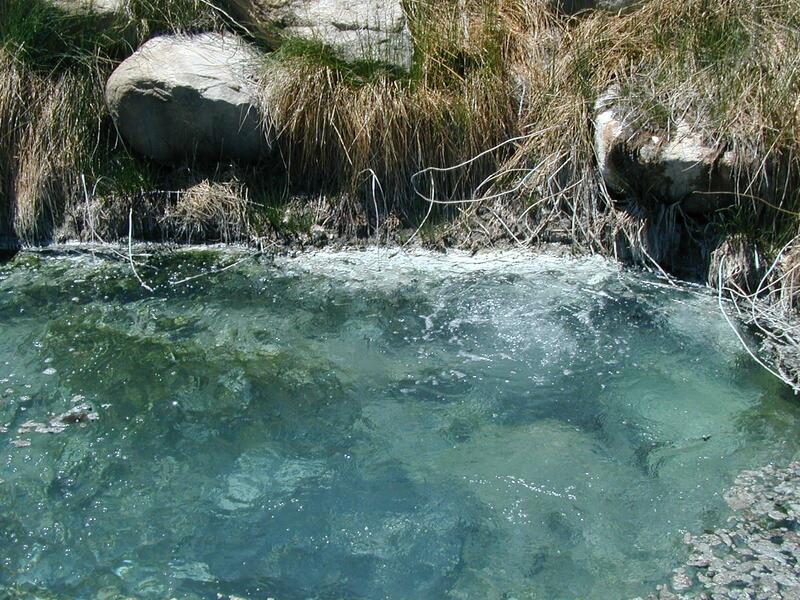 The town was named for this mineral spring that made a "chug chug" sound reminding one of a train. This spring no longer chugged, but there were half a dozen springs still around town. A nice relaxing afternoon in this small mountain town. GPS says N 40 28.945 W 106 49.719. 42 miles today. 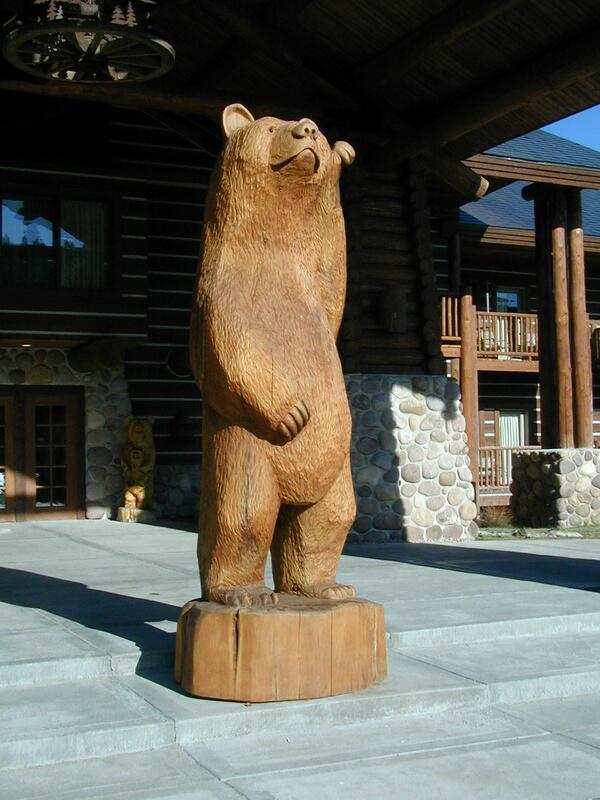 Welcome to the Moose Viewing Capital of Colorado and home of the nation's Christmas Tree in 1990. 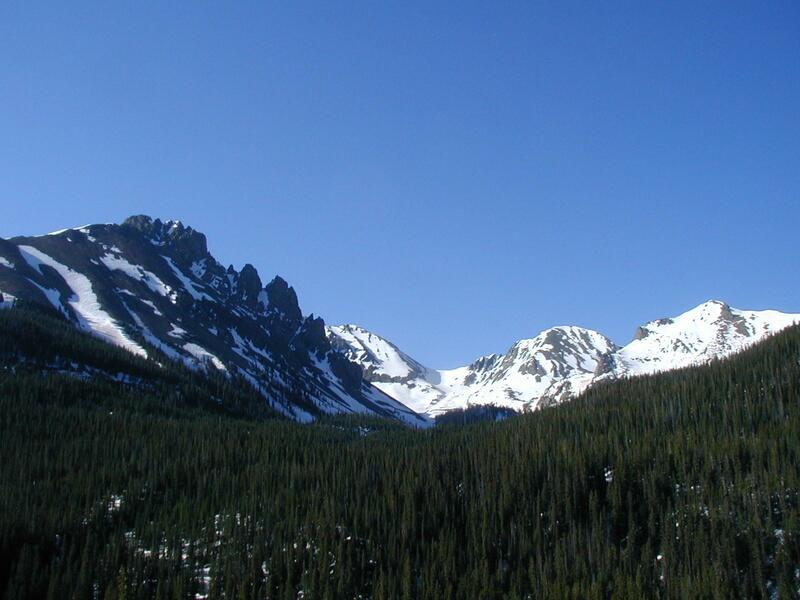 Made it to Walden today after a climb over Rabbit Ears Pass. 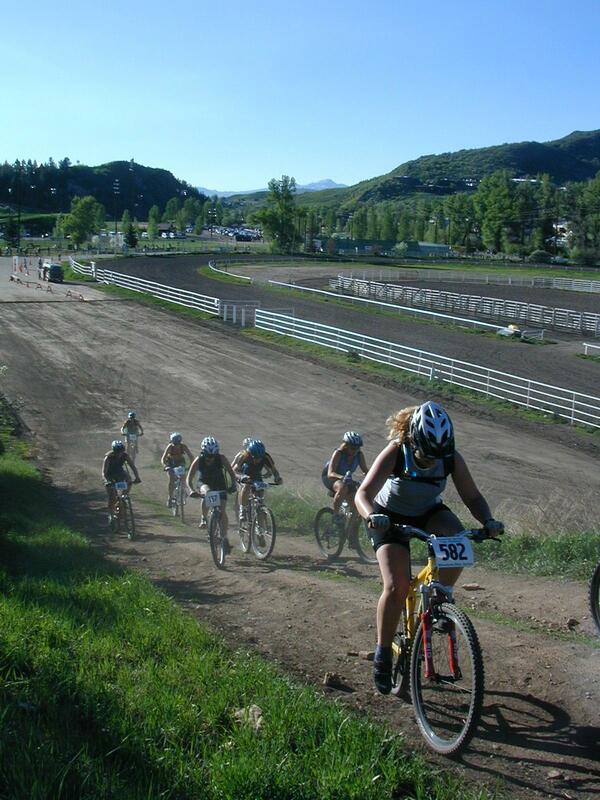 Yesterday in Steamboat Springs I went to see mountain bike races held in town. Some pretty strong cyclists riding up some of the dirt hills. It was fun to walk around town and take an easy day. 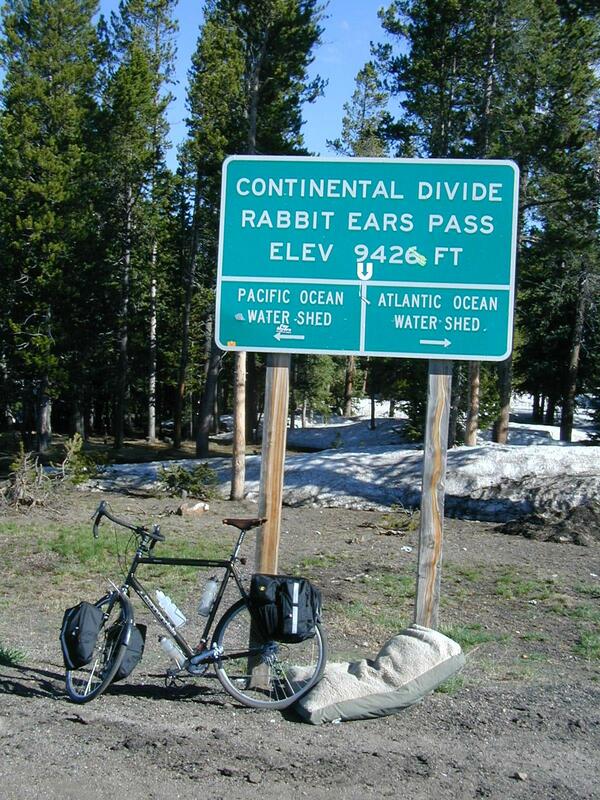 I was up at dawn again today wanting to ride Rabbit Ears Pass in early morning cool. In the first two miles I passed the ski area and then left town. Just past the six mile mark the climb began as the road quickly left the Yampa River Valley and started up the sides of the valley. It was a relatively steady climb, marked at 7%. I found that I could ride in low gear at 4 mph or walk at 3 mph and did some of both to get up the hill. After a fairly straightforward climb, the West Summit appeared past mile 13. 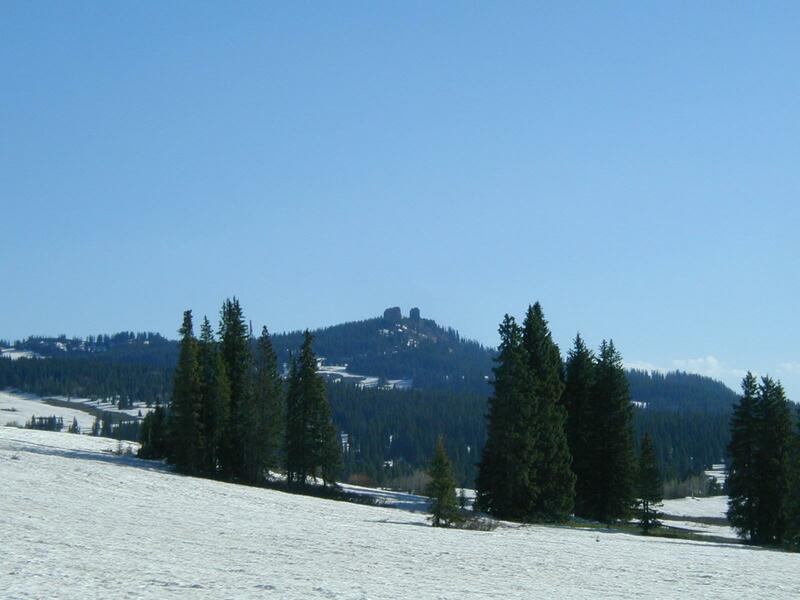 Around 8000ft snow appeared between the trees and still a good amount of snow near the top. For the next eight miles, the road had some steep climbs and descents as I made my way to the East Summit, elevation 9426 and the continental divide. Several trails here for cross country skiers and snowmobilers. Looked like between seasons now with not enough snow to ski and too much snow to hike. 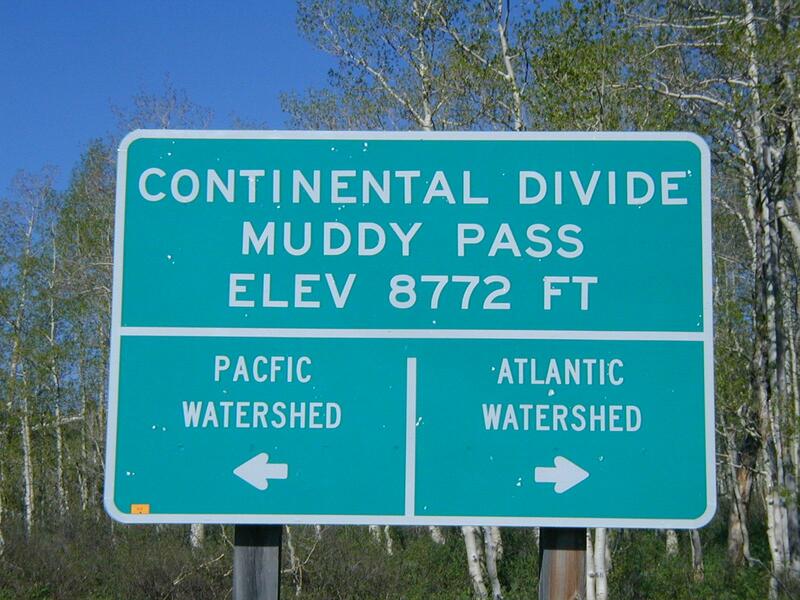 At mile 21 the road descended for good and reached Muddy Pass at mile 25. This was split between US 40 and CO 14. I thought briefly of riding via Grand Lake and Trail Ridge Road, but decided instead to head down wind and more directly towards Fort Collins. The trees started to go away as the road went into wide open North Park. Still some rolling hills with more downhill than uphill. I met a cycle tourist going the other direction. "Where are you headed?" "New Hampshire"... seemed like the wrong direction until he explained the Adventure Cycling TransAmerica Trail headed south along the Rockies from Montana, via Wyoming all the way south through Colorado. We traded road info and info about our respective trips before heading on. A stronger west cross-wind and occasional uphills kept the speed down, but I still made it to Walden in time for lunch. Recommendation was to eat at the Paradise Bowling Alley. Nobody was bowling but with 50+ people eating lunch this definitely seemed to be the place to eat in Walden. After lunch, wandered down the quiet main street and found the library. Several motels and cafes, but still seems like a fairly quiet little town. I've been here on two previous bicycle trips, so officially California is now "connected". However, will still be fun to ride over the last and highest pass tomorrow and head back to Fort Collins. GPS says N 40 43.634 W 106 16.904. 59 miles today. Long mileage today but also 5000ft of descent and only 2200ft of climb. It is nice to end a trip by riding home. I left Walden in early morning dawn. Walden is in middle of North Park, a large open area without sagebrush, grasses and not many trees. It took 13 miles before I passed the first substantial groves of trees. Fortunately not much wind in early morning. A very gradual climb as I followed the Michigan River. At 21 miles was Gould and I'd only climbed from 8000 to 8900 ft.
From Gould both more trees and a slightly steeper climb. 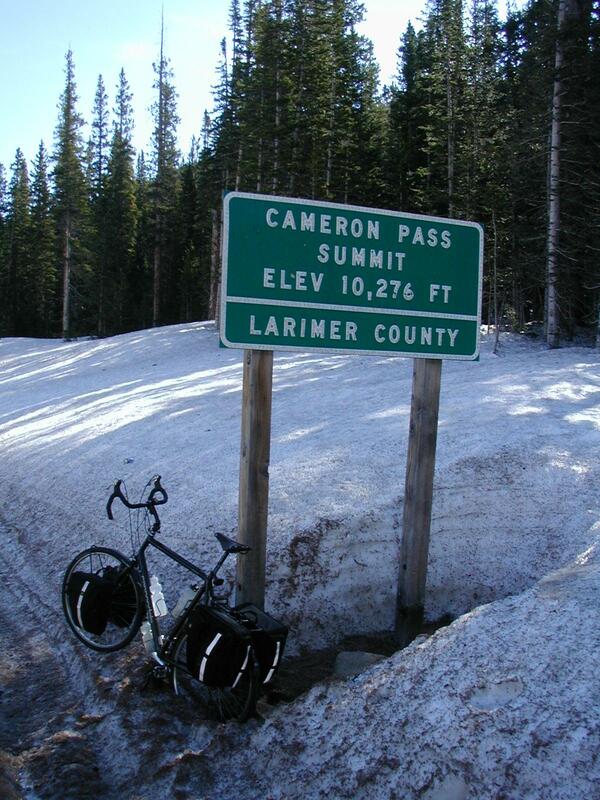 Still, it wasn't until mile 30 that I crested Cameron Pass at 10,276ft at 9am. A few feet of snow here, but also occasional bare spots. Not quite suitable for either skiing or hiking. Descent! The downhill started immediately with slight pause as the road passed Joe Wright reservoir. Here a sign said "hill 15 miles" at it was true. Steep enough to keep descending, but not so much that I needed to brake much. Wow, fun to just keep descending down. At mile 40 I met another touring cyclist heading uphill. Ken Kifer had started in Alabama and was heading west. 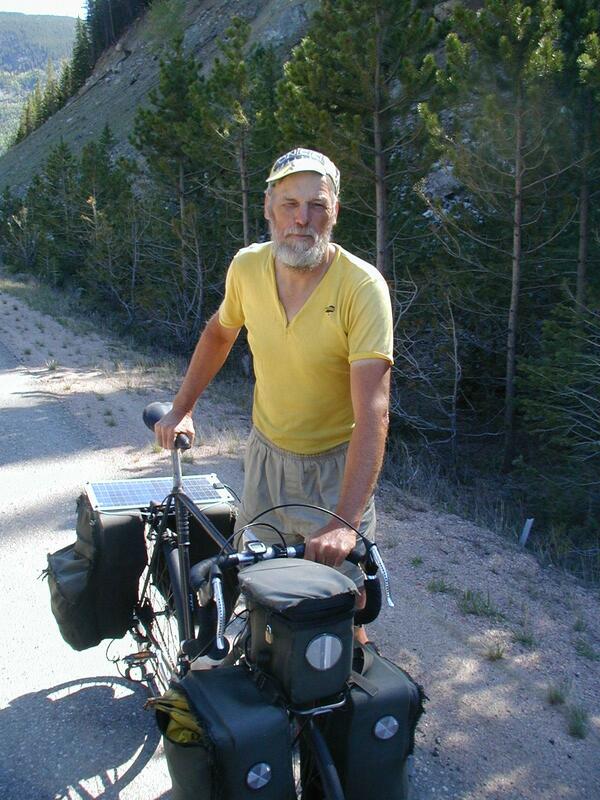 Ken keeps one of the best known and organized cycle touring web sites. We both knew each other by name and by our web sites, but hadn't met before now. Had a good conversation and traded road info before I continued on descent. After mile 50 it leveled off more and I needed to occasionally pedal more. Still downhill kept me riding quickly until I stopped at Mishawaka Inn at mile 74. The restaurant overlooked the Poudre River which was full and surging with brown waves of spring runoff. After lunch, contined riding rest of the Poudre Canyon to mile 87. Now back in familiar haunts as I rode down through LaPorte and back home to Fort Collins. This has been a fun week of cycling. Beautiful scenery with some climbing, but nothing too severe. Weather cooperated well, almost no drops of rain fell while I was riding. My mittens, fleece, wool hat all went unused (though CO mountains can be unpredictable and I'd probably bring them again for a May ride).